Hello stampers!! Happy Monday to you:) I hope you all had a fabulous weekend. This weekend was my "girls day" with 2 of my best friends. We went and got our hair done (mine was in desperate need!! ), got mani's and pedi's and then dinner and a bit of the casino. I don't gamble much but it was nice to see my friends play and actually win:) The Sunday Emma and I spent the entire day in my craft room making Easter crafts. I had to make a couple cards for a gal at work. I will share what those look like down below. Today's share is what I am calling Brushed Easter Egg. I have seen this card around Pinterest and had to make one myself. It is just very simple and very elegant. It measures average size of 4 1/4" x 11" and then scored at 5 1/2". It is a Whisper White base with a piece of Whisper White on top of that measuring at 4" x 5 1/4". I used my Oval Framelits and cut an Oval out of the top piece of Whisper White, traced it onto my base which allowed me to stamp my image where it needed to go. But it's not too late to get your free items. 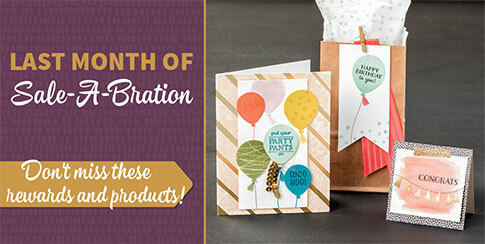 Sale-A-Bration is going until March 31st. Click on the image above to see the amazing products that you can still receive for free with your purchase of $50 or more before s/h and tax. Now here is a quick peek at the Easter cards that I made for my co-worker's grandson's.